Are You Serious About Your Training Goals? If So, You Should Only Invest In Serious Training Equipment. Get your Gronk on with this high performance WaterRower designed to take the beatings of professional athletes. Why rowing? Ask Patriots’ Rob Gronkowski who has implemented the water rower as a staple part in his training: "The WaterRower has been a great addition to my year-round training. It's a full-body workout that allows me to get a great sweat while keeping my heart-rate up... all without putting stress on the joints." Take Your Training To The Next Level. If you are looking for a way to train your entire body and effectively burn fat but have a bit of joint concerns at the same time, this water rower is a must-have for your home or gym. Replicating the exact rowing feel, it allows you to perform your cardio sessions with virtually infinite resistance variability. Not to mention that since the resistance is water-based, you do not need to ever lubricate it or worry about the noise levels. Enjoy soothing and relaxing workouts with practically zero intrusion! 6 Reasons Why The Gronk Fitness WaterRower Belongs In Your Gym: • It’s the exact same water rower Rob Gronkowski and other pro athletes use to excel in their sports. • Highly effective fat loss solution, low impact on the joints and minimal noise levels. • Unique self-regulated resistance that emulates the natural dynamic of rowing. • Durable, handmade aluminum frame and tall seat that fits every man or woman. • Targets all major muscle groups and safely elevates your heart rate. • It’s the last rowing machine you’ll need, covered with an upgradeable 1-year residential & commercial warranty. Order Your WaterRower Today And Work Out Like The Pros. Click “Add To Cart” Now While This Limited Edition Is Still In Stock. 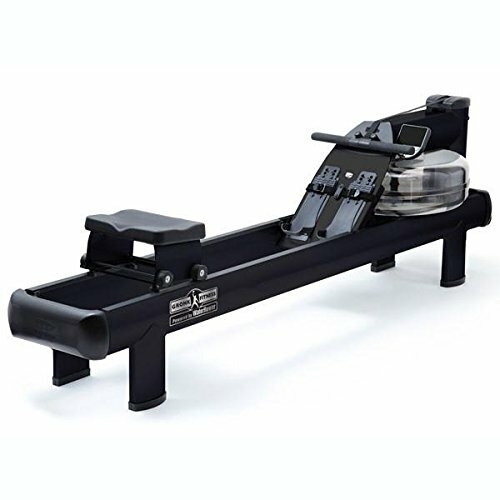 TOP RATED ROWING MACHINE ON THE MARKET: The Gronk Fitness water rower is the only rowing equipment with zero negative reviews on Amazon or anywhere else! Don't believe us? Check the reviews for yourself! It was designed to take the beatings from the top athletes in the world and that's why it's the perfect addition for your home or gym. FULL BODY CARDIO WITHOUT THE JOINT PAIN: Contrary to similar rowing machines, the Gronk Fitness rower features a "water flywheel" which not only replicates the feeling of rowing in the water but also ELIMINATES any joint discomfort or pain. Not to mention it really packs a punch when it comes to extreme calorie burning! BURN FAT & BUILD MUSCLE: The WaterRower powered Gronk rowing machine is an unparalleled full body workout option since it literally targets all your major muscle groups. You can selfregulate the resistance as much as you want, from low intensity fat burning cardio to extreme muscle building sessions. CONVENIENTLY FITS YOUR BODY TYPE: No matter your height, weight or build, no matter if you're a man or a woman, the Gronk Fitness water rower is designed for you. It features an extra tall seat that can support up to 700lbs and the latest S4 monitor that is cutting-edge, yet simple enough to be used by everyone! THE LAST WATER ROWER YOU'RE GOING TO BUY: The Gronk Fitness water rower spares no expenses when it comes to its design and that's why you'll never need to get a new one. The durable aluminum construction and the black powder-coated carbon are the reasons why this WaterRower is covered by a 1-year warranty, easily upgradeable to 3 or 5 years with a simple online registration. If you have any questions about this product by Water Rower, contact us by completing and submitting the form below. If you are looking for a specif part number, please include it with your message.